Natural Bee Pollen for Horses | Complete Nutrition | Raw Superfood | Springtime, Inc.
Pollen grains are a natural source of vitamins for horses. They can help sustain a healthy springtime bloom all year long by providing live enzymes, antioxidants, vitamins, and minerals to support breeding, digestion, muscle, hooves, and coat. "he immediately started to improve..."
Bee collected flower pollen was the first supplement marketed by Springtime back in 1979. Not only is it our oldest product, but it's also one of the most effective. We sell top grade, whole granules. Each batch is hand picked for freshness and flavor. We are very serious about this product. After almost 40 years it is still the single most powerful rejuvenator we have experienced. Daily Maintenance: Give one scoop (2 ½ oz.) per 1,000 lb. horse. Amount may be doubled for performance, breeding, or if desired. Recommended: For best results, start out with just a sprinkle for the first few days and increase gradually. I first met Charlie Whittingham in 1980 when he began purchasing and using Springtime Bee Pollen. In 1986, I visited Charlie at Pimlico when he brought Ferdinand, his Kentucky Derby winner, to Baltimore for the Preakness. A moment etched in my memory is when the great trainer ducked into Ferdinand's stall and felt down the legs of his champion. The scene was repeated in 1989 when Charlie returned with another Derby champion, Sunday Silence. 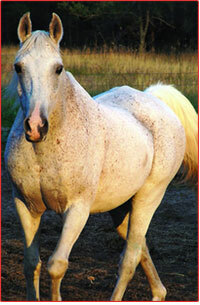 Charlie fed a lot of Springtime Bee Pollen to his horses and ate a lot himself. He was a dominating force in racing well into his eighties and trained until he passed away at the age of 86. Charlie gave Springtime a public endorsement, which helped us enormously. By his own account, Springtime Bee Pollen was a rejuvenating factor for him personally. 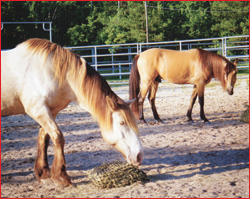 If you have ever thought about using Springtime Bee Pollen for yourself, your horses, or pets, now is the time. The current stock is excellent quality and the pries can't be beat. You don't have to be the world's greatest trainer to use the world's greatest natural food. Vicki's horse looks in great health. I am so glad I found you. My dogs and horses benefit from your wonderful products. My old horse pictured, is 34 1⁄2 in this photo. I recently ran out of Bee Pollen for him and thought, oh well, he's on pasture part of the day. But, in just a couple of months, he lost weight! We reordered our Springtime products, which I am sure he will be grateful for. It definitely made a difference in him initially, and taking him off of it was not to his benefit. He'll get this product for the rest of his life. Thank you from my animals! (L to R) Nikki, Kayla, Derby and Rugby. 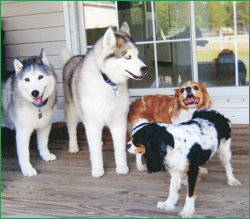 I have been using your products for several months now and couldn't be happier with the results... Our two aging huskies had slowed down due to joint issues and one had trouble tolerating every other brand of joint support we offered her (lots of puking). With Fresh Factors, she gets just what she needs with normal stomach function! We use Joint Health Chewables for her sister Nikki. Our two Cavalier Spaniel boys needed a little support to make that leap onto the "big bed"(that's our bed) and thanks again to Fresh Factors, we no longer are serenaded by whimpering and whining during late night forays off the big bed in search of whatever it is dogs search for in the dead of night when they should be sleeping peacefully! My horses shine (Spirulina Wafers and Bee Pollen), and are as bite-free as horses can be living in the coastal swamp of North Carolina (Bug Off Garlic). Never have supplements been so readily consumed. I use the Spirulina Wafers for trick training... now that's an endorsement! Thank you, thank you, and thank you! Our orders will keep coming and hopefully more from friends on Facebook (where I gave you a shout out) and my blog, where I have you linked. Violet taking great care with Addy Rose, Jenny’s granddaughter. "...she has improved her stamina by leaps and bounds..."
I just want to tell you that I cannot believe how powerful this Bee Pollen is! I put my horse, Violet, on it less than a week ago, and she has improved her stamina by leaps and bounds in just a short time. I would describe her as "delicate" — you had to ride carefully and lightly. She would not engage her hind end at the lope, and she would tucker out very quickly. 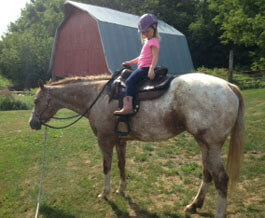 I rode her yesterday and pushed her just a bit to see how she was. It was like riding a different horse. I can't wait to see how she is after a month of the stuff! I purchased the Bee Pollen on your recommendation after telling you that last year she lost all muscle in one side of her face. The previous owners did lots of vet work, but no one could figure out what happened. She had been lame since then. She's on a combo of J-Flex and Bee Pollen and she is blossoming. Three years ago I purchased a horse, Yoda, who was navicular, laminitic and had been treated for EPM. 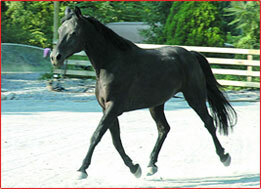 He had many issues, which I addressed with barefoot trim, diet, movement and herbs. He had an odd way of moving which I initially thought was due to his hoof issues. But when they recurred almost three years later they were diagnosed by my vet as a recurrence of EPM. I tried her recommendations which were acupuncture, etc. He still had the collapsing hind. I also tried a course of homeopathic prescriptions…no change. I remembered that I had seen the hind end malfunction when I first got him, and that it had gone away. I was doing a lot of herbs and the like at the time. I thought it might be Bee Pollen, and when I put him on it (double dose), he immediately started to improve. He went from barely being able to walk, to floating.